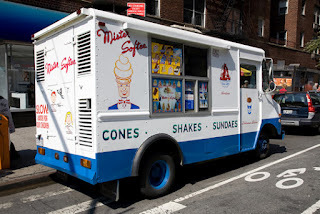 Nothing stands out more from my childhood than the first time I saw a Mister Softee ice cream truck. Let me rephrase that...heard an ice cream truck. It was magical. But you may be surprised in the fact that my first time was when I was 12 yrs old! Let me explain. While visiting one of my Boy Scout buddies on the edge of town, I heard the music FIRST– that Pavlovian trigger that drives all children to drop what they are doing and just react. At first I was like, "what's that?" And my buddy Paul said "It's Mr. Softee." My puzzled look said it all and he followed up with "...the ice cream truck is coming." We ran back inside Paul's house to get some money then, like the wind, we sprinted up the block. Like a hoard of sugar craving Zombies with dollars in hand the children of the neighborhood rushed towards the music with one singular mercurial purpose...hoping they weren't late to the party. Out of breath, we came to an abrupt stop. There in front of us were at least 25 kids ranging in age from 5 on up to adults. Since I had never seen a Mr. Softee truck – or Good Humor depending on where you live – I had no idea what to expect. "Brad, how could you not know about Mister Softee?" Well, you see, I lived in the heart of town on Cumberland Street. That was main street in downtown Lebanon, PA. USA. So whenever we wanted ice cream, Dieter, Frank and any other friends, brothers and sisters would just walk to one of three corner stores in the area – Big Bertha on Walnut Street, or the store at 3rd and Chestnut, or if we really wanted to walk, Hoffman's News Stand on the corner of 6th and Cumberland Streets. Each store had the same wonderful smell. A combination of old wood and sweet custard. To a child it was intoxicating. There, near the cash register, were several waste high freezers. Looking back now, I realize these were brilliant marketing devices, capable of luring even a 5 year old. There, just behind high impact glass, were stacks of Good Humor ice cream bars, and since we lived near Hershey, there was plenty of Hershey ice cream products in the freezer. Every possible tasty treat was spread out before us. Now if we wanted a Coke® Slushy we walked to the Turkey Hill Market on 8th and Chestnut. All of these stores were a ten minute walk and on a hot day...well worth the trip. So for us, there was no need for an ice cream truck...ice cream was within walking distance. But, in the suburbs, the corner store didn't exist, and if it did, you had to drive there. Of course back then a candy bar was 50¢ and you could get 100 pieces of candy for ONE DOLLAR! Whatever Happened To Penny Candy? by Richard Maybury can answer what happened to prices over the past 40 years. But I digress. What happened to the Mister Softee and Good Humor trucks? I mean, they are still around, but you can go broke trying to make money from an ice cream truck franchise. So I ask you: did Ben & Jerry's and Häagen-Dazs ruin Mister Softee? Or was it ice cream stores like Baskin Robbins and Dairy Queen? Or Did Customer Habits Change? and continue to sell and market as if it is 1977? When your customer changes, change your tactics. If they move, you move. I know this can be exhausting because it requires constant diligence. But remember, children used to chase those ice cream trucks…now, those ice cream trucks are looking for customers. The children DID NOT MOVE! Their habits changed! Take a lesson from Mister Softee. 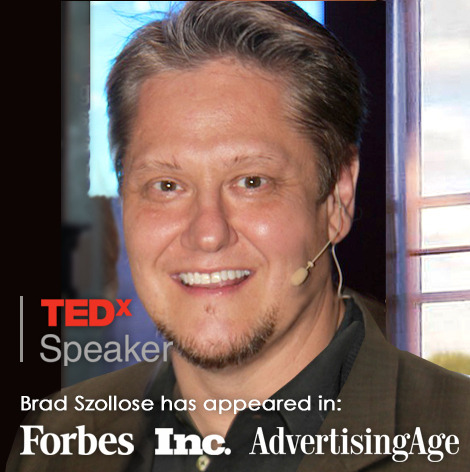 Reinvent your sales, marketing and branding tactics at all times. Look for markets that are secondary such as those corner store freezers. Social media may be hot today, but pretty soon it will be replaced by something else. Your customers love for ice cream is still there, it is only their habits that changed. 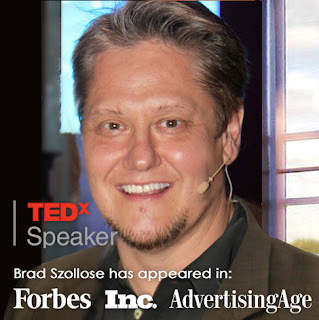 Your job as a business owner, marketing pro, or executive is to adapt and change according to your customer. You’ll be glad you did. And BTW: We have Mister Softee trucks all over the place in New York City...here they get a crowd. Pretty cool when you can drive to where your customer needs you most. activity at the Taurus-Littrow landing site. Courtesy of NASA Image of The Day. Most Boomers remember this from our childhood: We were promised that in the year 2000, technology was supposed to solve everything. By now I was supposed to be living in a domed city on the moon and flying to work with a jet pack. "Imagine a little boy sitting on the floor of his family’s living room, watching television. He is fascinated by a live broadcast—in black and white, of course; the flickering image on the screen is of a man in a space suit, descending a ladder. Anyone alive today knows that image: the first man landing on the moon. 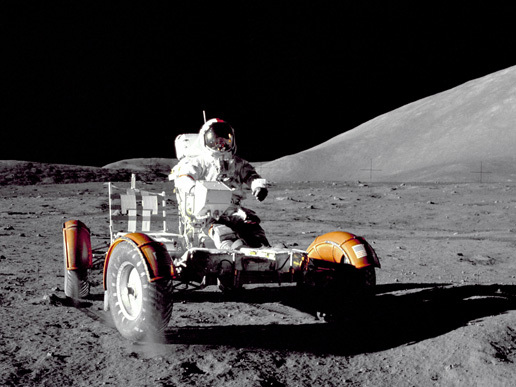 It was 1969, and two men were actually standing on another world more than 250,000 miles away. It was the beginning of a new era. Imagine being that young boy. Everything in his world promised a future where men and women could travel to the farthest corners of the galaxy. This wasn’t science fiction or an overactive imagination; all across America, television shows and the media were all telling him, This is going to happen. His toys were about the future. Theaters were putting out a barrage of movies to tell him about the future: The Day The Earth Stood Still, Forbidden Planet, 2001: A Space Odyssey, Omega Man, Planet of the Apes, Soylent Green (was Charlton Heston busy back then or what?). There were British shows too, like Dr. Who, Space: 1999, and UFO. Eventually, THX-1138, Star Trek, and Star Wars would also make it to the big screen. In the future, the young boy would be able to work in a domed city on the moon, use a flying car or a jet pack to fly to work, and have a business meeting in a floating satellite encircling Earth. His teachers were telling him so. His parents were telling him. Even his scoutmaster was telling him. There was proof—now “astronaut” was a job title, and there he was, driving a jeep on the moon. This future was going to happen . . . it was real . . . it was just a matter of time. Currently our country is going through a bumpy ride. Our economy barely has a pulse...(even after Black Friday and the Christmas rush), our school system needs an overhaul, geopolitics are heating up, and Baby Boomers are wondering: What the Hell Happened? 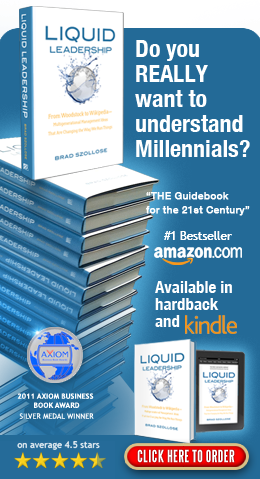 Plain and simple, Generation Y Millennials is the generation that was actually prepared for the future, whereas us Baby Boomers were told about the future, and what to prepare for. If you think Gen Y is about to grow up, have kids and get a mortgage, you are mistaken. 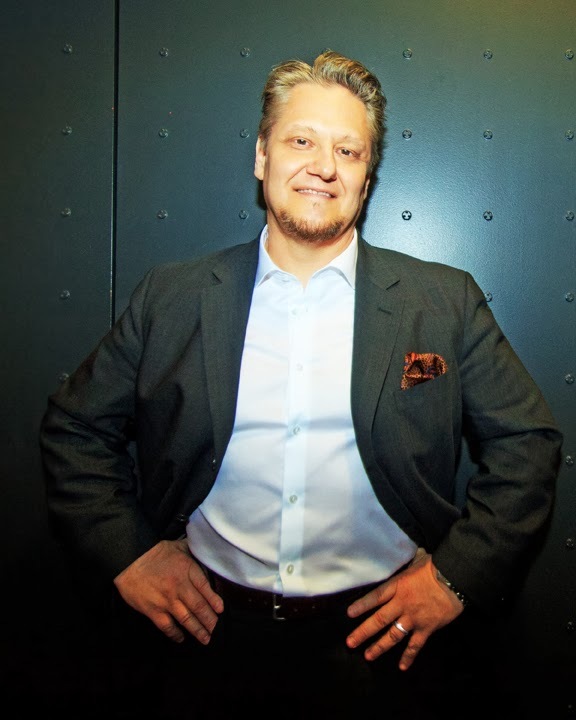 They have a skill set that most corporations are in desperate need of...and the idea of working their way up the corporate ladder is a strange paradigm to them. Instead, they believe in running the company before the age of 30 while skipping the entire linear idea of a career. If you need to understand how to survive and remain employable, I suggest you pick up my book. If you don't want to take the plunge just yet, here is a FREE chapter for you to ponder your future: Just click on the image and download the PDF. Now I want you to understand, I am not trying to promote me, me, me...I am a Boomer, and what I am trying to do is get the word out through my writing. 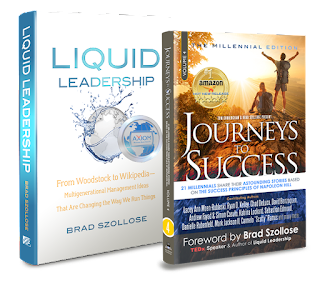 The entire reason I wrote Liquid Leadership was I started to realize that my fellow Boomers had no idea that there was a storm coming. A storm that if they did not keep up, would leave them out of a job. Please let me know if my work is relevant to you, and what needs more. I encourage all your stories from the front lines of leadership. After all, leadership is about adapting to change.